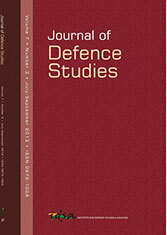 The Journal of Defence Studies (JDS)is a quarterly, refereed research periodical published by the Institute for Defence Studies and Analyses, New Delhi. It seeks to encourage further research on the core issues of defence, provides the latest perspectives, and serves as a platform for sharing research findings and opinions of scholars working on defence-related issues. The Journal contains a mix of research articles, essays, topical commentaries, opinion pieces and book reviews. Each issue includes articles on varied themes of relevance to the Indian Armed Forces, including emerging security threats and scenarios; civil-military relations; higher defence planning; doctrines and concepts; organizations and structures; command and control mechanisms; logistical support and sustainability issues; budgeting procedures and practices; and other related issues in the area of defence and national security. The Journal would also focus on issues concerning defence policy, reforms in defence sector, and defence economics. book reviews of around 1,500 words. Detailed Guidelines for Contributors can be found here. We would like to engage with our readers, to know their opinion on the content of each issue as well as seek their help in making JDS into a world-renowned journal that appeals to the strategic community. Letters can be sent addressed to The Editor, Journal of Defence Studies, IDSA on the following email id: associateeditor.jds@gmail.com. The Journal reserves the right to use the letter in its original form and/or modify, carry excerpts from the letters. The copyright of JDS rests with IDSA. Submissions to JDS should be original and not published elsewhere, or submitted for publication elsewhere. The Journal reserves the first right of refusal. Submissions will be evaluated initially by the JDS Editorial Board, which will take a call on the suitability for inclusion in the journal and for further peer review/refereeing. The submissions will be peer reviewed/refereed as well as undergo a plagiarism check. The Editor/Institute reserves the right to make a final decision on publication post-review as well as the right to make alterations. Selected contributors will be informed of the decision to include their articles in the forthcoming Journal issue via email. Selected contributors will receive an honorarium for their contribution. If you seek to use an article published in JDS as part of another work, then you will need to get the requisite permission from the Journal. Do remember that all stages mentioned above—from initial review to peer review/refereeing, and finally publication—involve time-consuming processes. We will not entertain requests for early publication owing to impending thesis submissions/degree requirements.